Indian Coast Guard Ship Samudra Prahari apprehended two Sri Lankan trawlers namely Holy Cross III and VI along with 29 Sri Lankan nationals on Saturday (24) around 4.30pm in Lakshadweep waters for poaching of endangered marine species, sea cucumber. In a swift air-sea coordinated search these fishing boats were located 18 nautical miles or approximately 35-kms West of Chereapani reef, Lakshadweep islands. Thereafter, ICGS Samudra Prahari apprehended both the boats 40 nautical miles and approximately 72-kms from Chereapani reef after a hot pursuit. On October 23 at about 8pm, Coast Guard District Headquarters located at Kavarati received a message from police control room at Kavaratti regarding sighting of two unknown fishing boats by local fishermen off Chereapani reef, Lakshadweep islands. Immediately Coast Guard vessel on routine patrol in Lakshadweep and Minicoy island was diverted for search and locate unknown fishing boats and simultaneously Coast Guard aircraft was launched from Kochi in the morning of October 24 for air- sea coordinated search. 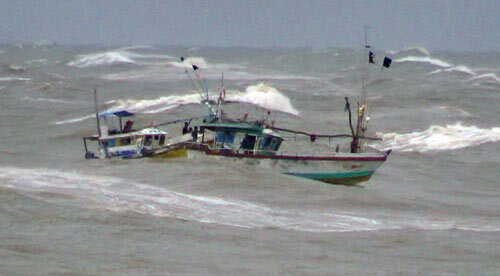 After hot pursuit and firing of warning shots, both Sri Lankan fishing boats Holy Cross III and VI were prevented from fleeing and apprehended off Chereapani reef. The boats were in possession of approximately 4,000kgs and 5,000kgs of Sea Cucumber each, an endangered species under Schedule I of Wildlife Act 1972 and declared highly protected marine species. The 29 Srilankan poachers engaged in recovery of sea cucumber were taken into custody. This is the first such poaching incident in 2015 and the second time that such an incident has taken place off Lakshadweep waters. The ICG efforts to educate fisherman as eyes and ears in community interaction programme and intelligence input from police agencies for coastal security construct has paid rich dividend, and resulted in apprehension of these boats. This is indicative that joint efforts by stakeholders associated in coastal security mechanism can prevent any illegal activity in India’s maritime zones, a communique from ICG District Headquarters here states. Both the Srilankan fishing boats are being escorted to New Mangalore Port, being the nearest designated port, for handing over to local police for further legal action. It was on April 7, 2014 that ICGS Rajdoot had arrested 16 Sri Lankan fishermen while poaching sea cucumber in India’s EEZ. ICGS Rajdoot with assistance from fishing boat St Antony had apprehended the Sri Lankan fishermen with bonafide identity cards issued by their government.